At long last I am FINALLY able to site down and give a full recap of our trip on the 2010 Hot Rod Power Tour! 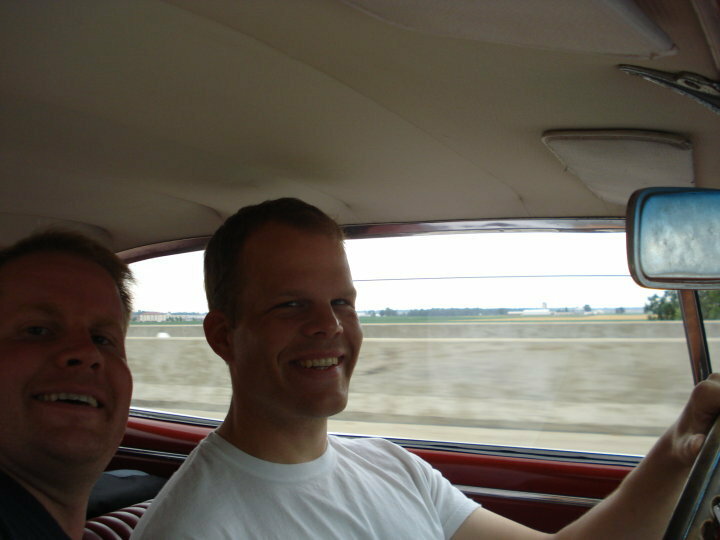 My buddy Aaron and I somewhere on the 2010 Power Tour. T-shirts and V8’s go together! My buddy Aaron and I palled up to do the Power Tour again! Aaron is one of the few people I trust to work on my car as well as drive it. He’s like Chuck Yeager on wheels and can drive and fix anything. Definitely the guy you want with you for something like this. The Chevelle a few days before the power tour kicked off. Aaron was welding in the new transmission tunnel – the welder is on the right in the picture. As I mentioned, the Power Tour kicked off at the Iowa Speedway. Aaron and I met up there along with my wife, kids, my brother-in-law’s family, and even my dad (we dig cars in our family). If there is a recession going on in America right no one told the hot rodders – there were cars and vendors EVERYWHERE. The Lingenfelter Trans Am was there, a Pantera, a truckload of newer Vette’s, Camaro’s, Mustangs, and Challengers, and all of the old great muscle we expected to see, and then some. The crowd was international as well – including a couple from South Africa in a new Vette and 3 guys from Australia in new Ute’s – one was red, one was white, and one was blue (the Ute’s, not the people). Chip Foose was there signing autographs too! We immediately ran into people that we had met the year before and also recognized a lot of cars. It was kind of a homecoming! Chip Foose signing autographs and generally being a super cool guy. That night we drove back to Ames for the night, changed the break-in oil out of the new motor, tweaked a couple of things, then packed up for the trip. Nothing like a 2000 mile road trip to make sure everything works, right? 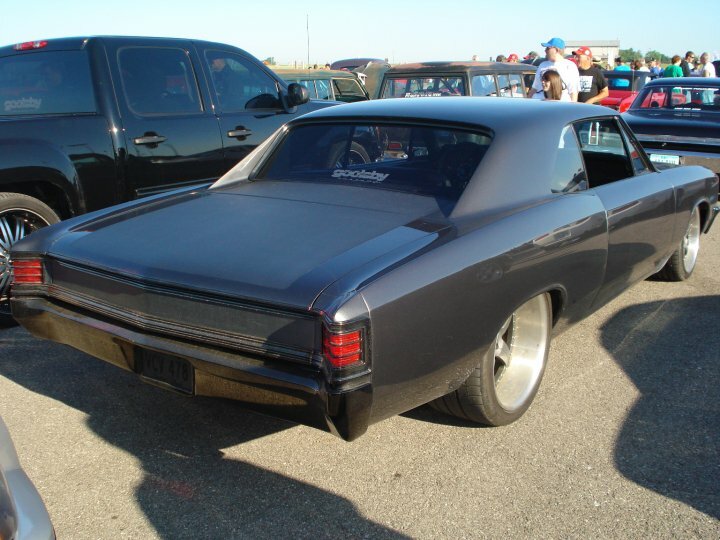 We left Sunday morning from the Iowa Speedway after a kickoff from Hot Rod Magazine Editor David Freiburger. The P/A equipment was on the fritz, so he climbed on top of a trailer and screamed out instructions to the entire group which numbered in the thousands. He did a great job and it was surprisingly easy to hear him. (Funny guy, by the way. He said that if they attempt to take your picture to not act like an idiot to increase your chances of getting in Hot Rod Magazine. He then gave examples of what an idiot might do.) While we were waiting for the crowd to launch we met a cool Canadian and checked out his home-brew rear suspension on a pro-touring style ’68 Mustang coupe. Cool guy and car! Just like us, he had literally just put it on the road. We then launched with the crowd and started driving the first leg to Springfield, IL. The weather was perfect and we were able to snap a lot of pictures as we went. We stopped at one place to do a quick electrical fix, but otherwise it was just a fun drive. A shot from the road. Does it get any better? Once we arrived in Springfield it was clear that there had been a mis-communication with someone somewhere along the line. They had us set up to park in the downtown area…..which was completely ripped apart with road construction. Not a huge deal, but definitely not quite what we were expecting. That night we met up with the three Aussie’s and checked out their Holden’s. Fun guys, as you might expect. They came over to the U.S. for a MONTH to drive and have fun and the Ute’s were all less than a year old (and two had blowers already). They even had a Youtube Channel for their trip – click here to view it. The 3 Holden Ute’s. Even their license plates were sequential. The next morning we decided to get to the next destination early, so we skipped the official launch and headed in the most direct path we could see. It turned out we weren’t the only ones with this idea as we ended up in a convoy with GM Performance Parts, the headline sponsor of the Power Tour. We were sandwiched in between their ’55 Chevy E-Rod and 3 new Camaro’s. Needless to say, we felt extra cool. 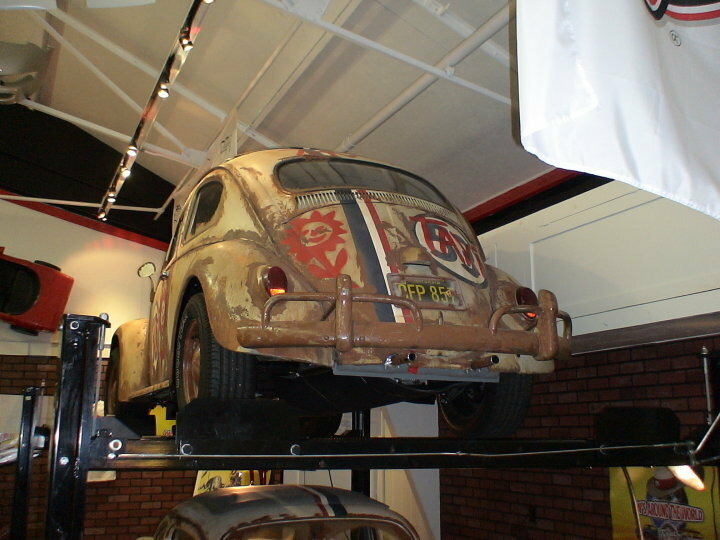 Herbie! The rust and grime was all just movie makeup. After lunch with Herbie we boogied down the road to the next stop, DuQuoin, IL. They set us up for the fairgrounds there. That day we met with some nice people a GM Performance Parts and learned all about the E-Rod (which is a modern crate motor with cats and computer that can be dropped into an old car to make it emissions legal). Great guys. 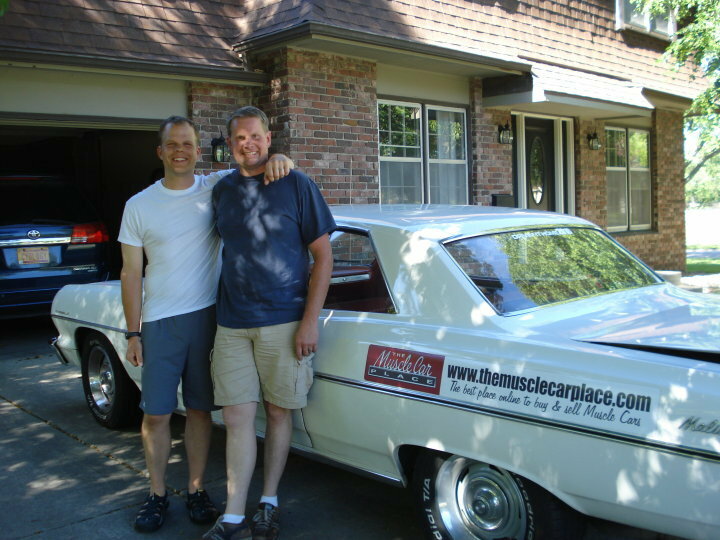 We then milled around and talked to Goolsby Customs about this ’67 Chevelle. We had no idea where the brake cylinder was. Turns out they trick mounted it in the car. The firewall is absolutely smooth! Goolsby Gustoms ’67 Chevelle. It had a Roadster Shop Chassis. We then went to the hotel for the night and met another ’64 Chevelle owner. He had just done the uber-popular LS Motor swap and showed me all of the tricks involved. Great guy. I will be schleping off of his efforts in the future. The next day would be our last on the Power Tour, and had the best driving. 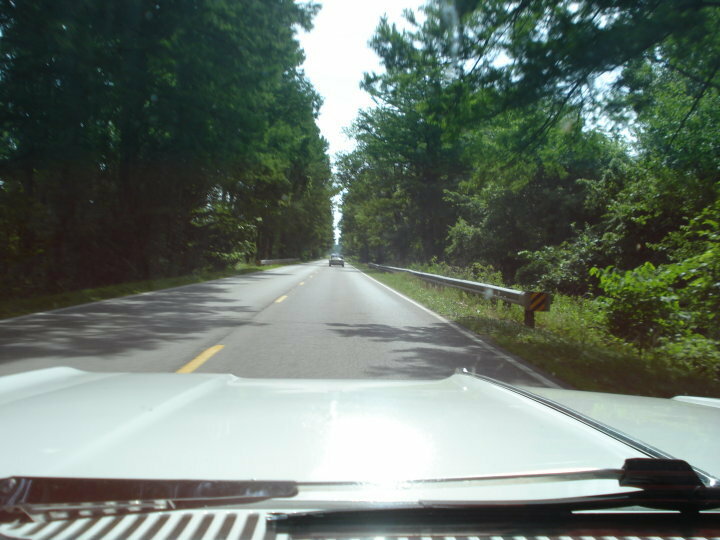 This was a trip to Bowling Green Kentucky on the tightest 2 lane roads you’ve ever seen. My buddy Aaron was driving an RV for another friend we met, so I drove the Chevelle by myself and kind of played Smokey and the Bandit with him (I was blocker). He got the worse end of the deal for sure as he ended up losing a side mirror on the RV while crossing a bridge that was (we found out) not wide enough for an RV and a semi to pass by each other head to head. Aaron felt terrible about it, but from my view it looked like he saved the RV from losing it’s entire right side – he couldn’t have done any better. I’ll let the pictures speak for themselves. After the Bowling Green stop we cruised through the Corvette Musuem and saw the Bowling Green assembly plant where Corvette’s are built. 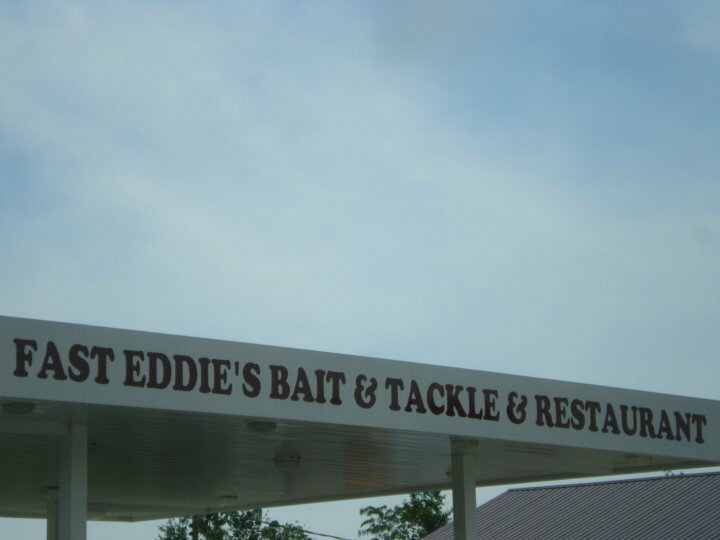 Fast Eddie’s. We didn’t stop, but the place was packed. 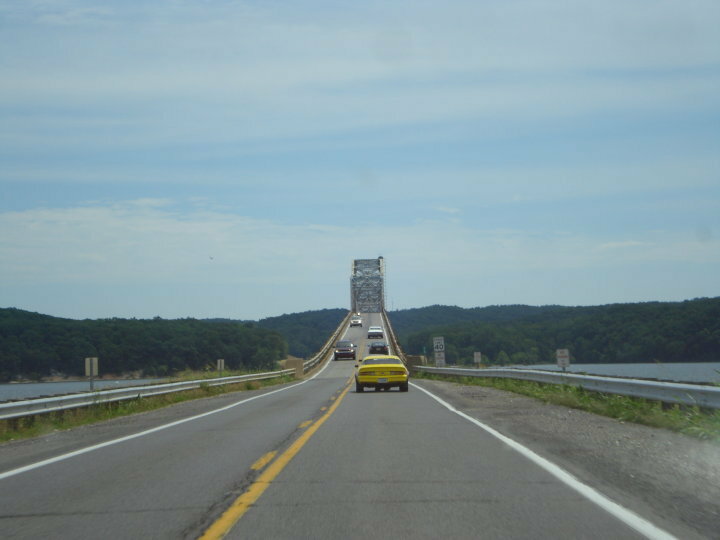 Question: Can a big RV and a semi pass head to head on this bridge without clipping something? Answer: No. 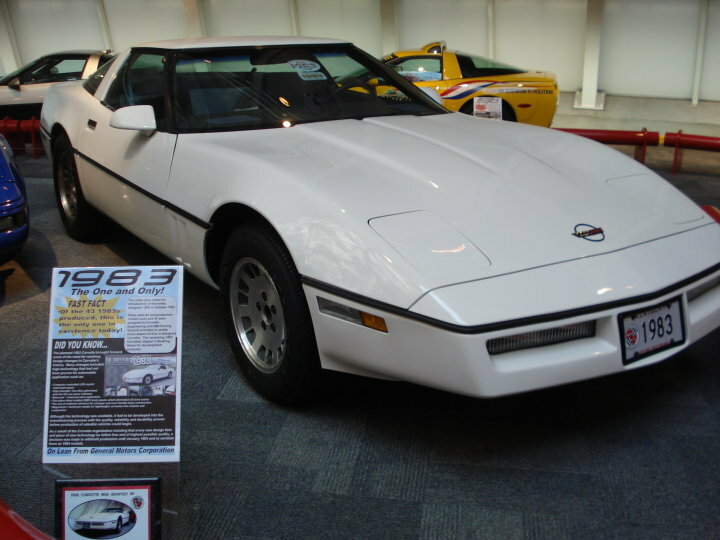 From the National Corvette Museum – the only remaining ’83 Corvette! The next day we headed home and drove 700 miles straight – a few pictures are below. It was a great trip and I can’t wait until next year! For more pictures from our trip, or to upload your own, please visit our Facebook Page! 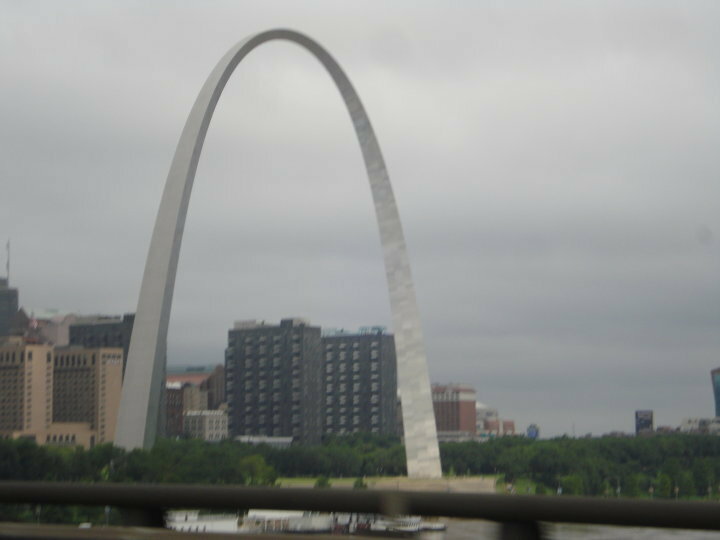 Passing through St. Louis on the trip home. I’ve always wanted to take this picture. It took a while to find a semi with clean wheels. We made it! 1800 miles on a new engine and 5 speed, and only one small fix was required. Not too shabby. Always take a buddy on trips like these! The trip was fun, but it’s always good to get home. 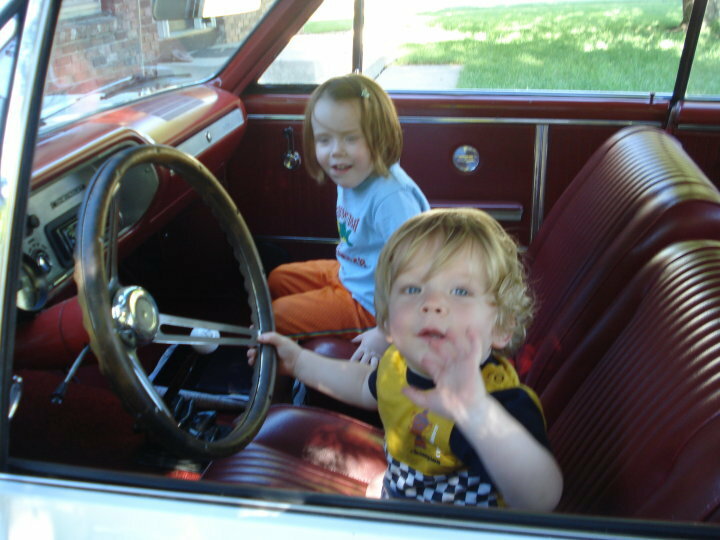 My kids were glad to see me, but jumped in the Chevelle before I could really even say hello. I’m not sure what to make of that. I enjoyed the trip summary. Sounds like you and Aaron had a great ride! How is that 5 speed working out ? How do you think it could benefit my 1965 442 that is an original 4 speed car that my dad purchased new? 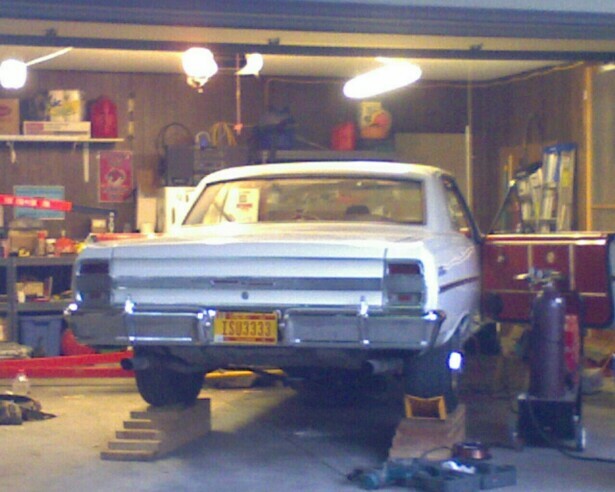 What rearend ratio are you running in your Chevelle? Has your fuel mileage been affected? What rpm at 60 mph? The 5-speed is terrific. 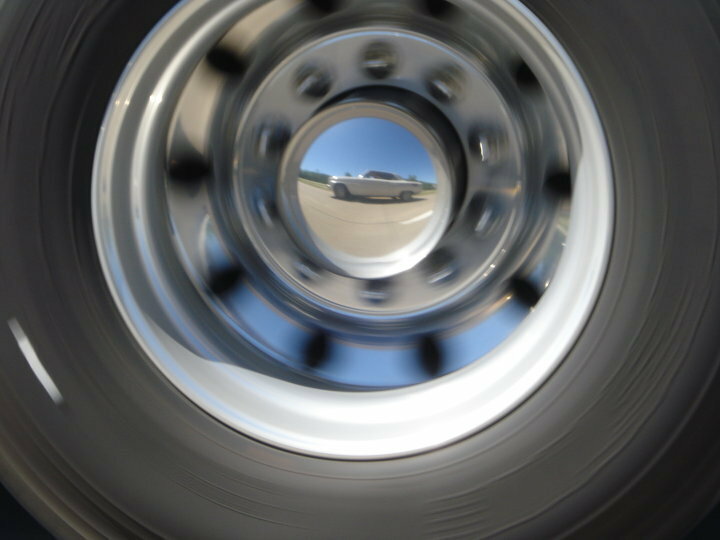 With a 27 inch tall rear tire and a 3.55 rear gear I turn about 2300rpm at 60 mph. Fuel mileage jumped from 14.5 mpg on the highway to about 17.5 mpg. 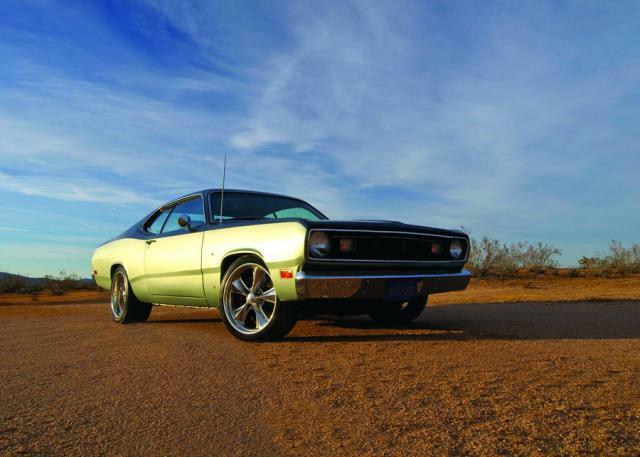 There are a few other companies that sell TKO 5-speeds that you may wish to contact – especially with an original car. Hurst Drivelines does not machine the transmission down at all – so it requires quite a bit of cutting to the floor. A few other companies prep the trans up a bit so as to require as little floor cutting as possible.